Home > Copper Patina Effects > Modern Masters Green Patina Aging Solution - 4 oz. Always apply your Green Patina Aging Solution BEFORE the Blue Aging Solution Since it takes longer to activate. Wait 5 minutes or so- then apply the Blue. Experiment with this! We found that this process works best, by dropping on some tablespoon size puddles of the Green Patina Aging Solution in various locations leaving a fair amount of space void, so you can add the "Blue Aging Solution" on to your surface- and so it does not all merge and just becomes one large lake. Make sure to leave some voids where there is no Patina Aging Solution. 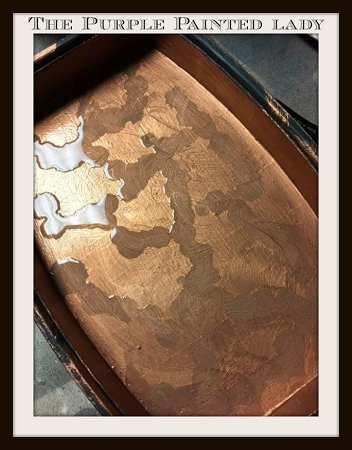 This will in the end- just be the dried shiny copper, which is a beautiful contract to all of the aged sections. Once you have both the Green and Blue Aging Solutions on- allow solutions to dry on their own and evaporate. This may take up to a good 6 to 8 hours- but they will! 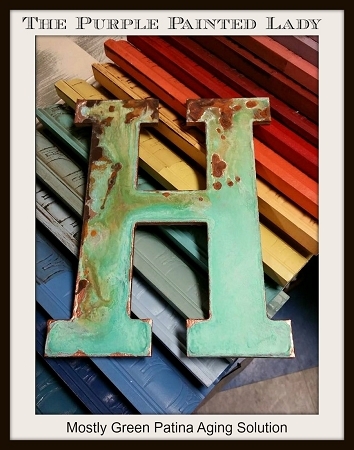 IF YOU ARE LOVING THE RUSTY METAL (orange) parts on some of these examples- that is created by throwing a little Iron Reactive Metallic Paint on top of your wet piece once done adding your Green and Blue Patina Aging Solution. I used just a little iron! Once you have the Iron Reactive paint on... and I think it looks best with just a little dabbled here or there...then you spritz it with the Rust Patina Aging Solution.